The humble doughnut has had a makeover. 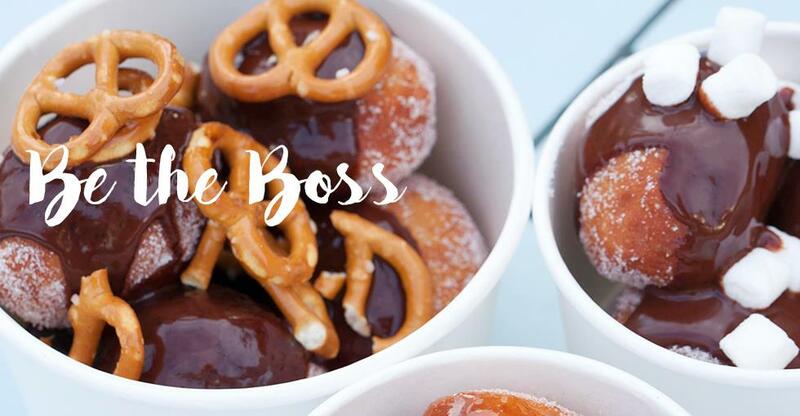 Forget the bog-standard glazed ring or the traditional jam and sugar combo, because creative doughnut makers Betsy and Jo have transformed the sugary snack into a gourmet experience. Founded on a simple love of food and baking Betsy and Jo now run their very own Donnuterie, You Doughnut, creating handmade, bite-sized doughnuts covered with mouth-watering sauces and toppings. We spoke to Jo about their new venture. Can you tell us a bit about yourselves and your backgrounds before starting You Doughnut? We both met at university 10 years ago when studying photography and we were keen bakers and loved food. We remained close friends and Betsy had worked for Petra Barran [of KERB] in her original street food truck, Choc Star, for about four years, part-time. Both of us worked at a festival in the truck and we loved it. It gave us an insight into what the lifestyle would be like when running your own business. We were struggling in our jobs, so we took the plunge and came up with the idea, starting part-time, and after a year we gave up our jobs and went full-time with YD [You Doughnut]. We just love desserts and we can't finish a savoury meal without having something sweet afterwards! We loved meeting up for tea and cake and sharing our baking experiments at home. When we came up with the idea, we realised that there really weren't that many doughnut places around, so we saw a gap in the market for a hot and fresh dessert. Instead of going down the pre-made route we wanted to try something different. People loved the fresh doughnuts with hot sauces. Even though we sometimes had jam-filled ones available, they weren't interested in those! We had memories of eating hot doughnuts by the seaside when we were children, so we took that nostalgic idea and elevated it to a gourmet level. Did either of you have any baking experience beforehand? Apart from working in the food industry, we didn't have any training; we were just keen home bakers (thanks to our mums and Nigella Lawson!). What makes your doughnuts stand out? What’s your secret? Our USP is absolutely the hot and fresh nature of our product. We mix, roll, cut, fry and top the doughnuts in front of the customer. Our doughnuts are never served more than a few minutes old and unlike traditionally filled doughnuts, we cover ours in sauces and toppings. We also use yeast and rise the dough twice, giving it a fluffy inside. Our sauces are all original and made by us and we love coming up with new flavour combinations. What three tips would you give to small-business owners? Your idea has to be original, with a stand-out brand logo and name, something people will remember. Do not underestimate the power of social media: it's absolutely integral to growing your following and showcasing your ideas to the world. And of course, your food has to taste good. Street food is served in all environments and weather conditions so it must be able to stand up to that without being too complicated. We stuck to the idea of doing one thing really well, and it's worked for us so far. Oh, also, working for another street-food company is the best experience if you are thinking of getting into this industry. Offer your services for free and get stuck in as it's invaluable.